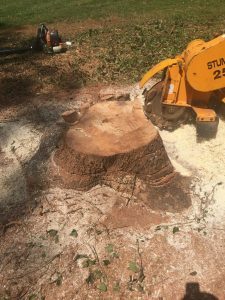 Charlotte residents looking to get rid of any unsightly stumps from their property can count on Tree Works to get the job done right. We provide affordable stump grinding in which we grind your old tree stump down to the surface. This also protects the lawn area around the stump, which would be otherwise disturbed through the process of stump removal. The tree removal process gets rid of trees from your property. However, it can leave an unsightly stump in your yard. That can negatively affect your landscaping while also making yardwork a more difficult endeavor. Stump removal can be a costly expense, although stump grinding is a much more affordable service. The process of grinding the stump also creates mulch, which can actually be used in any of your flower beds. This will serve the purpose of controlling moisture in the soil and keeping weeds from wildly sprouting. Old stumps are a breeding ground for pests and that also includes termites. Stumps infested with termites can be problematic when they are close to a property. If those termites find a way into the foundation, homeowners could be faced with major repair problems. Why provide pests with a perfect nesting place when you can get rid of them altogether with stump grinding. We know you have plenty of choices when it comes to stump grinding services in Charlotte, NC. However, when you enlist the services of Tree Works, there are lots of reasons that make us the one and only choice. Proper equipment and tools – This makes the job much easier and provides a very polished and finished look. We have advanced stump grinders to get the job done right. Fully insured and licensed – If a problem occurs with the stump grinding, Tree Works is fully protected and covered. Affordable Prices – We are committed to providing great service with great prices as we value the members of our community. Great customer service – The customer remains our top priority as we will only quote fair prices and get every job done quickly and efficiently. At Tree Works, we will also provide you with helpful tips. For instance, when you get rid of an old tree and want to plant a new one, make sure you do it a minimum of five feet away from where the old tree stood. This will ensure that your tree’s roots will develop properly.